The ISCCC hosted a public forum with Planning Minister Mick Gentleman and Climate Change Minister Shane Rattenbury on 13 February 2018 to learn more about the ACT Government’s Housing Choices and Zero Net Emissions Strategy discussion papers. The Housing Choices discussion paper explores the kind of housing that people want, so that we can plan and build a Canberra that meets people’s needs. The new Climate Change Strategy puts Canberrans on a path to reducing the city’s net emissions to zero by 2045. The crowd of over 80 people at the forum did not question the need to drive down emissions, but asked how the city’s planning and urban design could match this vision. Many people raised concerns about poor build quality, which meant dwellings were not meeting the government’s minimum energy efficiency standards and did not guarantee that buildings would last long into the future. Insufficient set-backs and large buildings on small blocks did not enable greenery to flourish, which meant an ‘urban heat island effect’ risked creating suburbs several degrees hotter. 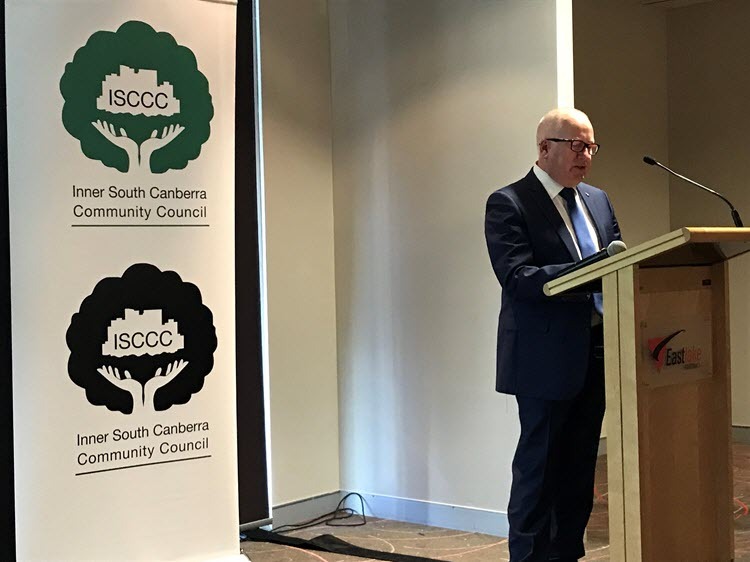 The ISCCC is a non government organisation formed to provide a whole-of-Inner South Canberra approach to community issues. It is not a local government body. The Inner South Canberra Community Council core objective is to preserve and improve the social, cultural, economic and environmental well being of Inner South Canberra residents and the broader community. Find out more about ISCCC or become a Member. Keep informed and join our email list.